Dallas' premier event doesn't make money. But the man who runs it does. Errol McKoy is, quite possibly, the highest paid carny ever. He got a degree in economics from Northeastern State University, but during school breaks he worked as a ride operator at Six Flags Over Texas. At 26, he became the youngest person ever to land the top job at a theme park, and he holds patents in the United States, Germany, and Switzerland on rides he helped develop. In 1988 he was lured away from Six Flags to become president of the nonprofit State Fair of Texas, where, in 2008, his total compensation for overseeing the three-week spree of pig shows, fried food, and midway rides was $758,918. Later this month, McKoy’s operation will once again take over Fair Park. The theme for this year’s installment is “Super Sized Fun.” The question is, How has McKoy managed to apply that theme to his paycheck? According to the Economic Research Institute’s Linda Lampkin, McKoy is the highest paid manager of a state fair in the country. His peers don’t even come close. The president of Virginia’s state fair, which brings in about the same revenue, makes $219,037. 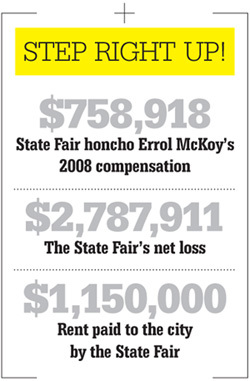 McKoy’s compensation is not just an outlier among his fellow state fair managers. In 2008, the State Fair brought in total revenues of $36,319,776. The average compensation for the highest paid people working for Texas nonprofits with revenues around $40 million is $209,265. McKoy also paid each of the six supervisors under him—Lee Winton (finance), Robert Hilbun (maintenance operations), Ron Black (food and beverage), Mitchell Glieber (marketing/public relations), Jaime Navarro (VP controller), and Eunice Sloan (VP exhibits)—more than $170,000 in 2008. Four earned more than $200,000. These seven employees made a combined $2,256,486—in a year in which the State Fair reported a net loss of $2,787,911. Let’s step back and explain how it came about that the head of a midsize nonprofit earns nearly three times more than the city manager of Dallas (Mary Suhm oversees an operating budget of about $2 billion), and why it has escaped any sort of public outcry. A spot on the State Fair board has historically been prized by the old-school business class of Dallas. It comprises primarily the highest-powered players in the city—the good ol’ boys, though there are eight women among the board’s 51 members. (Yes, 51.) McKoy’s job is also one of the plum gigs in the city. He was preceded by Wayne Gallagher, who was president from 1972 to 1987. Former chairmen of the board included R.L. Thornton (’45-’65) and Robert Cullum (’66-’79). In other words: the past and present of the State Fair are the product of (mostly) men who aren’t generally questioned about how they run their affairs. Not out in the open. More than one powerful civic leader refused to talk on background about McKoy and the way he runs the State Fair. The man wields enough power that members of the establishment are afraid to be quoted even without attribution. If McKoy deserves his handsome compensation, as Dunning believes, shouldn’t the State Fair have more to show for it? Shouldn’t it be adding to its cash reserves for a rainy day (or month), instead of operating at a loss on paper—especially since the fair’s ability to pay its $1,150,000 annual rent to the city depends on its financial health? Most of the State Fair’s profits get “pumped back into Fair Park,” as both Dunning and McKoy put it, pointing to the numerous roof renovations. McKoy describes himself as merely a tenant of Fair Park. His fellow Fair Park tenants, as it turns out, are among the few willing to voice any displeasure with McKoy and his managerial style. They have what could best be described as an uneasy relationship.